When there are so many amazing gift options to choose from, you might find it easier to let your special someone choose their perfect gift themselves. Our personalised gift vouchers are a wonderful way to treat someone, whatever the occasion. These custom gift vouchers can be posted or sent via email if you need them on the day, and are available in values from £25 all the way to £1,000. Choose from five gorgeous themed vouchers and personalise it with a message you can write yourself. It can be a tricky thing, choosing the perfect present. If you are not sure what they want, and you really don't want to risk getting it wrong, then personalised gift vouchers are the solution. Our range of custom gift vouchers come in a huge range of values; from £25 all the way up to £1,000. So you can really treat them to something special. Put the decision into their hands. You choose the theme and value of your vouchers, and whether you want it emailed or popped in the post. You can also add your own special personalised message, so they will know exactly who has been so generous. They can then decide how they want to treat themselves. 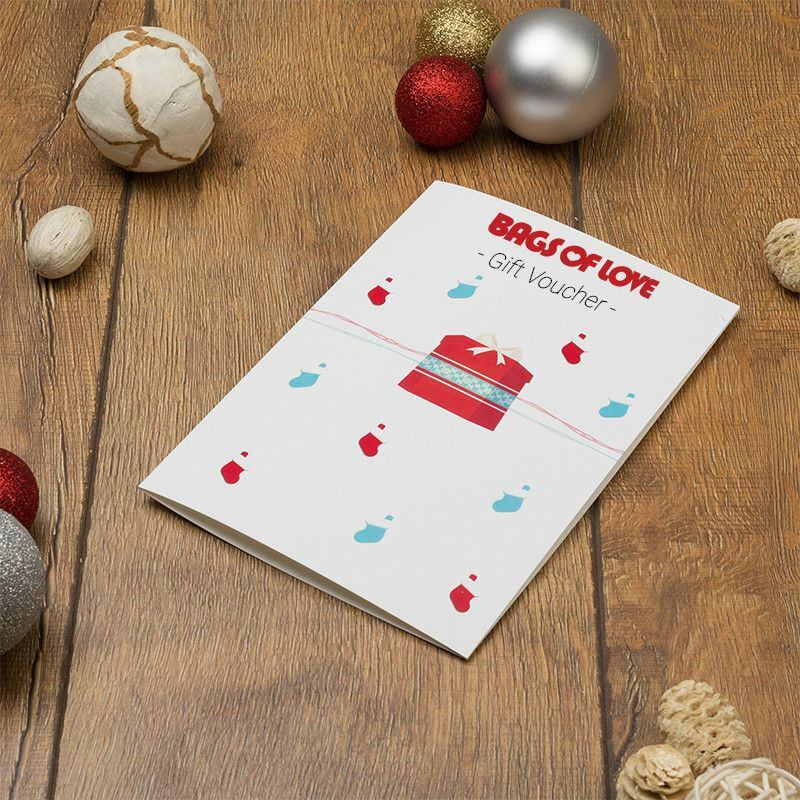 The gift vouchers can be used to purchase any product from Bags of Love, and with hundreds of personalised gifts available, they really will be spoilt for choice. It was quick and fantastic. Easy and arrived very quickly as well. Hugely satisfied. Thank You! What Will My Personalised Gift Vouchers Look Like? Because every occasion is special, we have created a range of themes for your custom gift vouchers. Choose from 5 different designs to suit your occasion. All five designs showcase the Bags of Love logo and the words "Gift Voucher," so there can be no mistaking what the recipient has received. The "Classic Gorgeous" gift voucher design features an adorable red handbag with a colourful spotty background. This design is perfect for birthdays or for a "just because" present. If you have a wedding coming up, then opt for the "Wedding" theme gift voucher. Featuring a simple yet striking design of two gold wedding bands, against a background of colourful hearts, this stylish design is ideal for any wedding. For a special birthday, the "Birthday" theme voucher showcases an adorable birthday cake and party hat design. Parents of newborns will love to receive our "Baby" theme gift voucher. Featuring a sweet pram design with a scattering of baby pink and blue balloons. Finally, the "Christmas" theme gift voucher will make the perfect Christmas gift for anyone. The front of this voucher has a pretty design of a Christmas present and colourful stockings. When ordered as a printed option, your voucher is printed onto the A5 white card. This high-end card weighs 250 gsm, making it beautifully thick and substantial. The voucher is inserted into a chic pale blue, handmade envelope. Note: We do not charge anything extra to make and dispatch the vouchers. You simply pay for the voucher value and the delivery cost (if applicable). Please note that this is not a charge connected with the gift certificate itself. The design of your gift vouchers is all taken care for you. All you need to do is select the design best suited for the occasion and the recipient. As well as choosing the design and the gift voucher value, you can also create a personalised message. This will be printed inside the voucher. You can treat this as an actual gift card, and fill it with all of the sentiments and words of love that you want. Who wouldn't love these gift vouchers? They really are the perfect gift choice, as you put the gift buying power into the recipient's hands. For that one friend who is an absolute nightmare to buy for, and always seems to return whatever gift they get, treat them to a personalised gift voucher from Bags of Love, and they will be amazed at what they can get. Or what about your sister, who already seems to have everything? A generous voucher for personalised photo gifts is sure to be something they have never received before. The vouchers aren't just a great gift idea for them; they are also great for you! If you are so busy, that you never have the time to hunt for presents in the shops or online, then one of our specialist, custom gift vouchers will be the answer to your present buying woes. Is it your mum's birthday today? Did you forget? Don't worry, we have you covered. Order the online version of the gift vouchers and we will email it to you right away. Your status as the favourite child remains intact!